I just made this cake for a big fan of Homer Simpson. 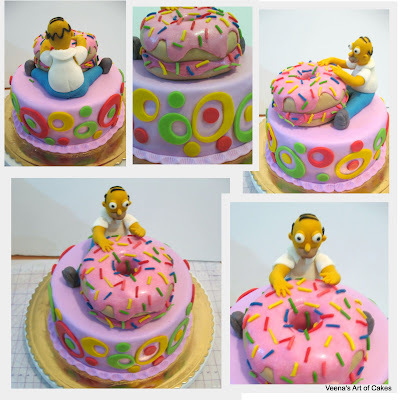 While I was very pleased with how the stacked donuts turned out I wasn’t very happy with how Homer turned out. I did take some pictures to show you how I made Homer but since I was so disappointed I dropped the thought of making this post. Incidentally, I was also on the guest list and amazingly when we walked into the restaurant with the cake, everybody was so excited to see Homer! In the very first 5 minutes I had the waitress come to me with guest requests for my business cards. Unfortunately, I had only six cards with me. You can guess what happened next – Homer and his doughnuts were having a photo session. The whole cake is covered inn Meringue Butter cream and my Homemade Fondant/Sugar Paste recipe. 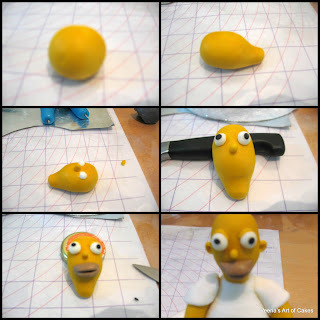 Anyway, here are a few pictures of my gum paste Homer Simpson in the making. In all I think the body came out quite nice. I think Perhaps,I should have re-done the head. In my defense I was just too tired and mentally exhausted that day to realize it. Anyway I think the collages are self explanatory. If you still have any questions please feel free to ask me. 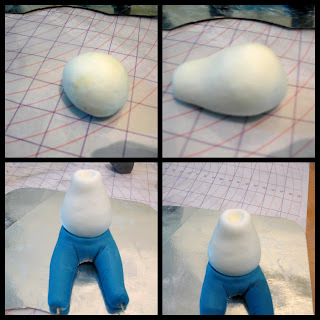 Start with a ball, roll a sausage, start tapering both ends until you reach this shape, fold the two ends in and dig into the pant top to accommodate the belly. Stick two cocktail sticks into the bottom to hold the shoes. Start with a large ball, roll into a pear shape, flatten the top of the pear and use your ball tool to indent so the neck will sit secure, taper the bottom a little so it will sit flush into the pants. Start with two similar size gum paste balls, roll into a long sausage tapering towards one end, Use your finger to make wrist; then flatten the palms and cut and shape the fingers. Use a semi circle disc of white for the sleeves and just wrap the top of the arm. 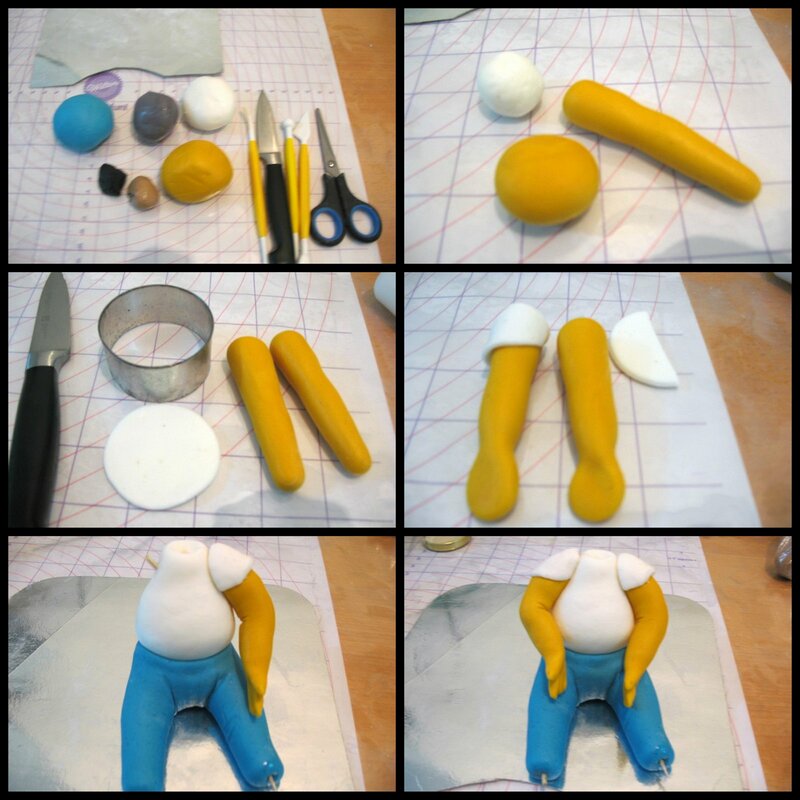 Use cocktail sicks to secure the arms in place. 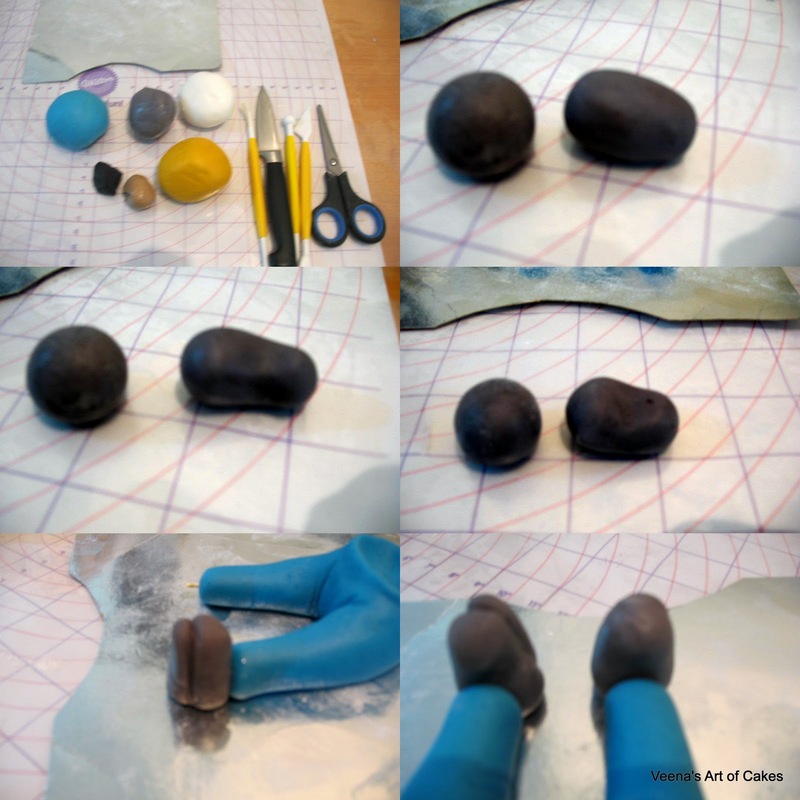 Make two similar black gum paste balls, using your finger, indent and roll at the same time to get the above shape. Make the shoe soles with the back of your knife and secure them to the pants with cocktail sticks. 5. Making the Head – I think the head should have been a bit larger and the forehead a tad taller. So if you attempt it – keep that in mind. 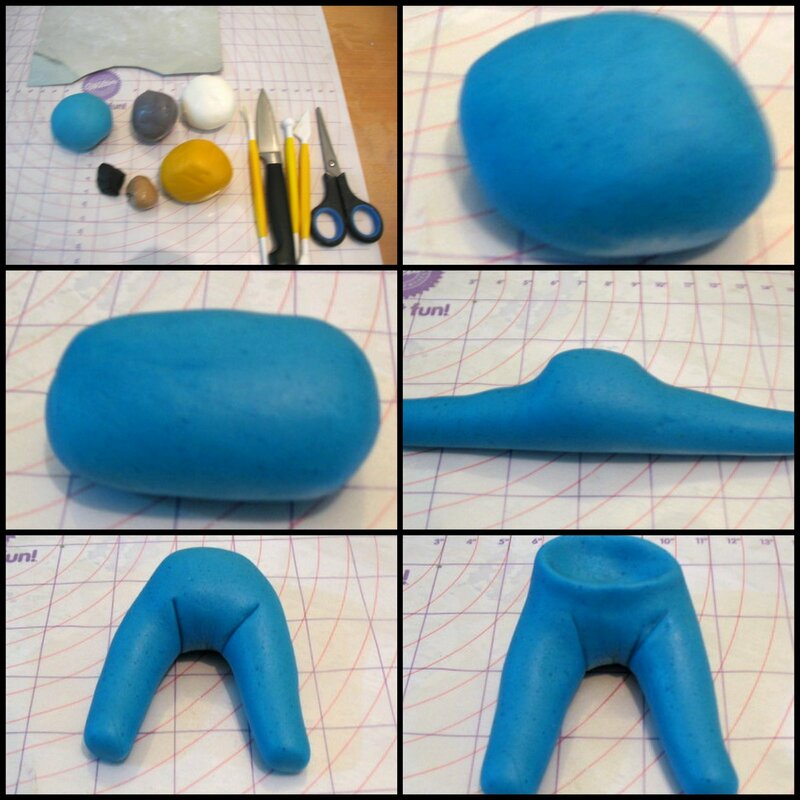 Start with a round ball, then roll a sausage, taper the roll to one end making a neck. Well, I hope you found some of it useful. Let me know if you have any more question. Thank you Veena for always sharing such amazing tutorials. I loved making my Homer. Thank you, Raymond. So happy you hear you find my tutorials helpful. Thank you so much for coming back to write this feedback. Appreciate it very much. Have a wonderful week. Lovely colours on the cake.Could you tell me how to make the shape of doughnut cake?Is the pink poured fondant or rolled.Whats the size of the cake and the size of doughnut.Thanks for ur replies. Shalu, the doughnut is just two thick layers of round cake each 2 inch high layered with buttercream. I cut the center out with a small round cutter from both sides. Then softened the edges. Wrapped the whole thing in fondant.